Roller derby is an American-invented full contact sport, based on formation roller skating on quad skates around an oval track. Each team has 5 members on the track, 1 pivot, 3 blockers and 1 jammer. Points are scored as the team’s jammer passes a member of the opposing team. Contemporary roller derby is international and in majority a female sport (An individual who identifies as a trans woman, intersex woman, and/or gender expansive). Men’s leagues have started emerge, but they are few and sparse. In roller derby, you can see all genders as referees and cheerleaders. 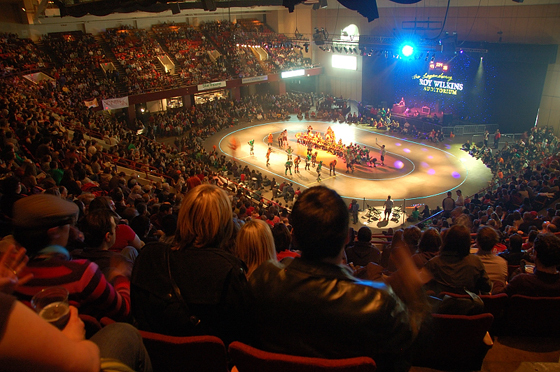 Roller derby is originally played on banked tracks, but most teams today play on so called ‘Flat Tracks’. The term Roller Derby dates at least as far back as 1922. Since, Roller derby has spread beyond its American roots, with leagues in Australia, Belgium, Canada, Finland, Germany, Ireland, the Netherlands, New Zealand, Sweden, Denmark, Finland, Switzerland, and the United Kingdom. Each league typically features two or more local teams which compete in public matches, called bouts, for a diverse fan base. Most players in these leagues skate under aliases, many of which are creative examples of word play with satirical, mock-violent or sexual puns, alliteration, and allusions to pop culture. Some players claim their names represent alter egos which they adopt whilst skating. Since 2009 season, some of the players have started skating under their real names. The jammers may continue to race and score points for two minutes or until the lead jammer “calls off the jam” (by putting their hands on their hips). Generally, a jammer scores four points each time she makes it through the pack within bounds and five points if she laps the other jammer! Like any sport, Roller Derby has many fine print detailed rules, penalties and strategies! And obviously, the team with the most points at the end of the game wins! The jammer is considered a “sprint” skater and is designated by wearing a star on their helmet. The jammers must break through the pack once and lap it before scoring. Both jammers can score on their second time through the pack, at which time they get one point for each opponent passed legally in bounds. LEAD JAMMER The lead jammer is the first jammer to break through the pack passing all the opposing blockers and pivot in bounds and without penalties. As lead jammer she may, at a strategic time call off the jam to prevent their opponent from scoring more points (by putting their hands on their hips). PIVOT Pivots are known as the pacesetters of each team and are designated by the striped helmet. The pivot is also responsible for calling out plays on a moment’s notice; all skaters look to this position for guidance. BLOCKER Behind the pivot, each team has three blockers on the track. 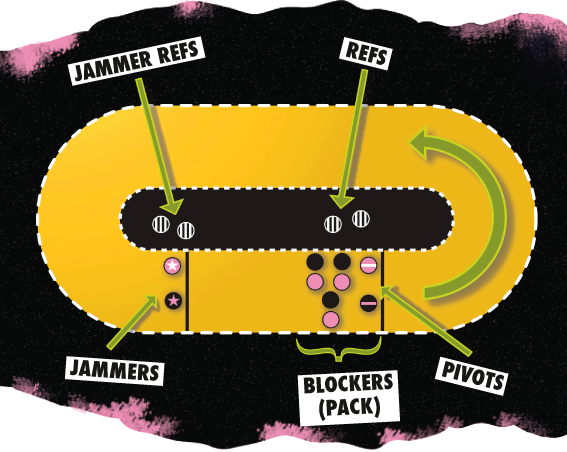 Blockers play vital offensive and defensive roles, helping their jammer get through the pack while simultaneously working together to block the opposing team’s jammer.POWER BLOCKER The power blocker is the last blocker in the pack lineup and the first blocker to challenge the jammers. Strategically, she works to break the speed of the opposing jammer and hold them back from entering the pack. If you want to see all this explained in motion, then please watch this great video from WTFDA.